Business card is called "Meishi" in Japan. When you meet somebody newly, Meishi is most important tools for you. When you see your guest, hand your Meishi to her/him before shaking hands. During meeting, you shouldn't play with their cards. It is considered to be rude. Your country code should be on your business card. You may lose your business without it. If your customer doesn't have an English Meishi, you should ask them to write their name and company name on back side. Now you can retrieve your contact person's information even if the card has only Japanese characters. This is the most effective project that Japanese workers have been working on. Everybody is seemed to make efforts to improve the job. Also 5S is used in Kaizen program. It is a drink party for various occasions. Welcome enkai and farewell enkai are very popular when you visit Japan in business. It starts with boss's talk and ends with Tejime. Many Japanese restaurants have rooms for Enkai. Sometimes Japanese Enkai is tough for foreigners since you need to sit on Tatami mattress bending your needs for a couple of hours. This sample room has sitting chairs. It helps you a little bit. This is a new style of restaurant to sit down. Japanese restaurants still use Tatami and Table set-up. The foot space is prepared one step down from the floor. It is much easier to sit down during drinking. When we start a party, we raise our glasses and toast saying "Kanpai".ie., cheers!. If you are the guest of the party, you will be requested to make a quick speech. If possible, it is preferable. If not, don't mind. Just make a speech in English or your language. At the end of the party, we close it with clapping our hands and praying everyone's health and happiness, business success.. There are two types of clapping hands. Someone say "Yooooo" then one clap. Someone say "Yooooo" then three claps pause three claps pause and 7 claps.. Afterward many clapping hands in both cases. It is typical local manner in Japan. This is a kind of stamp which has the name of holder. The hanko works as same as your signature to validate the approval of the owner. If the document which you made has a print of hanko of your boss, it means your document is approved. There are various type of Hanko. Most important of Hanko is "Shain" for a company and "Jituin" for person. "Sha" means Company and "in" means stamp. CEO has a "Shain" to approve the company's document. This is called "No Zangyo day". Employees are supposed not to do overwork. It is set on Wednesday or Friday. Japanese office was out low area concerning smoking. Even in front of the customer, they did not care to smoke. You might have a terrible experience that all your clothes smells smoke. The smoking situation becomes much beteer than before. Still you may have a trouble about smoking. Before getting to such situation, you had better to tell them you hate smoking. When you are going to use JR line with Super Express, you can specify the preference of the reserved seat, smoking or non-smoking. If you aren't very heavy smoker like chain smoker, you had better to select Non-smoking car. The smoking cars look like real smoke room to make smoked foods since ventilation is not enough. When you want to smoke, you can move to the designated car for smokers, smoke there, exhaust the smoke and come back to the seat. Sometimes Japanese use very strange characters in comparison chart. Sometimes triangle (△) is used as a symbol of intermediate or "yes or no". In this case, Plan 6 is the best choice. In Japan there are many advanced companies to make the Computer LCD projectors. But unfortunately less companies have LCD projectors in a conference room. If you want to make a presentation at a customer's office, you had better to inform them that you want to use your computer for your presentation. Even the office has the LCD panel, your computer may not work perfectly with the connection trouble. It is most important time for you to make a good presentation. You should prepare every thing for any occasion. And handout would be good idea to pass around before the meeting. It would be good to use many charts and drawing to make them to understand your presentation easily. During a Japanese presentation, Japanese presenter might not see your eyes and vice versa. We think it is rude to see the face and eyes of the customers directly. In your presentation, they keep face down and avoid to see your face. Even though don't worry. They are listening to your words. When you visit your customer you may see the strange movement. On specific time everyday, it is taken place. Average business men in Japan spend 1000 Yen for lunch. You can buy your lunch around 1,000 Yen. A married man makes both ends meet on his small lunch budget and tobacco. 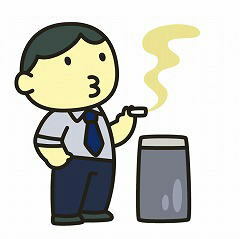 So tobacco is very good gift for Japanese smoker. And smokers like inexpensive lunch. If they eat 1,000 Yen lunch, they can't buy a cup of coffee also. Recently McDonald introduce 120 Yen Hamburger and total would be 400 Yen.. Fan of McDonald increased because of this lower price. If you buy their lunch, tight budgeted person would be very happy.